Just as a loudspeaker is used to produce sound in air, an acoustic projector or sound source is used to generate sound underwater. Loudspeakers convert electrical signals into sound in air. Similarly, acoustic projectors convert electrical signals into sound in water. (See How are sounds made?). Underwater sound sources (may also be called transducers) can be built in a number of different ways. Some underwater sound sources work the same way as loudspeakers in a home stereo system. They have a speaker that is vibrated using an electromagnet. Other sound sources create vibrations with special materials that expand and contract when electricity runs through them. Still other sound sources work much like a drum being played from the inside. A sound source or projector is used to create sound to do such tasks as find fish, navigate, measure water depth, and communicate underwater. The large circular object in the center of this image is an acoustic projector that is being deployed from a ship. The walls of the projector vibrate to make sound, similar to how a drum works. 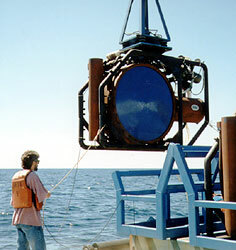 The sounds generated by this projector were used to measure the ocean temperature during acoustic tomography experiments. Photo courtesy of Scripps Institution of Oceanography. This figure shows a basic cross-section of a sound source that uses an internal driver and pistons to vibrate the walls of the source. The driver is an object that compresses and expands. As it compresses and expands, it pushes and pulls the pistons, which in turn deform the walls of the source, creating pressure waves. Projectors can be used in several ways. Some are placed on the seafloor. Others are placed on deep-sea moorings, with a float that holds them up and an anchor on the seafloor. Most often, projectors are mounted on a boat. A bolt through the hull or a transom can mount a projector on the hull of a boat. A projector can also be bound to the inside of the hull. The signal would then be transmitted through the hull. Finally, a projector can be lowered from or towed by a boat or placed on a trolling mount. The performance of an acoustic projector is described by specifying its source level, the frequency range over which it operates, and its directional properties. The projector source level specifies the amount of sound radiated by the projector. It is defined as the intensity of the radiated sound at a distance of 1 meter from the source, where intensity is the amount of sound power transmitted through a unit area in a specified direction. The unit of intensity is watts per square meter. Source level is rarely given in watts per square meter, however. Source level is commonly given as a relative intensity in units named decibels (dB). The relative source level in water is calculated as the ratio of the source intensity to the intensity of a sound wave with a pressure of 1 microPascal. Source levels given in dB in water are not directly comparable to source levels given in dB in air because a different reference pressure is used in air (See How does sound in air differ from sound in water?). Although the source level of a sound source is defined at a range of 1 m from the source, it is normally measured at much larger ranges. The equivalent source level at 1 m is then calculated assuming spherical spreading. The source level for large, low frequency sources must be measured far from the source. This is because the sound pressure levels close to the source form a complex pattern that is not the same as the source level calculated using measurements far from the source. The source levels for some sound sources are given in What are common underwater sounds? The projector source level can be used to calculate the total acoustic power transmitted by the source. A projector that transmits equally in all directions with a source level of 170.8 dB relative to 1 microPascal at 1 meter transmits 1 watt of acoustic power. ATOC HX-554 acoustic source (75 Hz) on the DSVSS Laney Chouest ready for deployment off Kauai during July, 1997. The acoustic source is a large ceramic cylinder mounted on a frame. Electrical current passed through the cylinder will cause it to expand and contract, creating the 75Hz sound waves for the ATOC project. Photo Credit: Scripps Institution of Oceanography. Projectors can be designed to work at high or low frequencies, depending on how the projector will be used. One consideration in selecting a frequency is the distance that the sound will travel. Low frequency signals are absorbed less rapidly in the ocean than high frequency signals. They can therefore travel longer distances and still be detected. (See Sound Absorption). 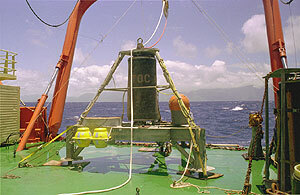 Echosounders used to measure water depth in the deep ocean, which is 4000-5000 m deep, typically use frequencies of about 12 kHz. Echosounders used in shallower water typically use much higher frequencies, often 30 kHz or more. Signals designed to travel thousands of kilometers have to use very low frequencies. The Acoustic Thermometry of Ocean Climate (ATOC) project transmitted signals at 75 Hz, for example. Another consideration in selecting the frequency is the size of the target. High frequency signals give higher resolution and can generate detailed images of the target better than low frequency signals. Fish finders, for example, typically operate at frequencies of 20-200 kHz. Side scan sonars use frequencies as high as 500 kHz to generate detailed images of objects on the seafloor, but the sonar then needs to be towed near the seafloor very close to the object (see How is sound used to find objects on the ocean bottom?). The frequency at which a sound source transmits has a large effect on its design. In order to transmit sound efficiently the size of the source needs to be roughly comparable to the wavelength of the sound being transmitted. Low-frequency sounds have long wavelengths, and low-frequency sources therefore need to be large. The 75 Hz sound transmitted for the ATOC project has a wavelength of about 20 meters, for example, and the sources are roughly 2.1 m (6.9 ft) high by 0.9 m (3.0 ft) in diameter (comparable in size to a large water heater) and weigh 2268 kilogram (kg) (5000 pounds). High-frequency sounds have much shorter wavelengths. At 75 kHz (75,000 Hz), for example, sound has a wavelength that is 1000 times smaller than at 75 Hz, 0.02 meters or 2 centimeters, and a 75 kHz sound source can therefore be 1000 times smaller than a 75 Hz sound source. When a projector sends out a sound, the signal spreads away from the source. If the projector is omnidirectional, the sound will spread out equally in all directions. However, if the projector is directional, the sound will be stronger in some directions than in others. Fish finders and echosounders are typically designed to create a cone shaped signal, with the point at the transducer. The angle of this cone determines the coverage area of the signal. Directional projectors come with a variety of narrow and wide cone angles. Highly directional sources must be large in size compared to the wavelength of the sound being transmitted. In some cases a single, large projector is used, particularly for high frequency signals, but at lower frequencies this is often not feasible. It is then more convenient to use an array of smaller projectors that transmit in unison to construct a directional projector.